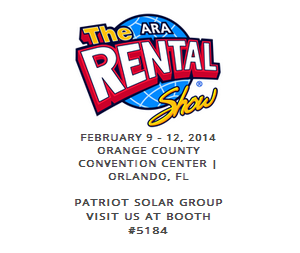 Patriot Solar Group will be attending this year’s Rental Show in Orlando Florida, February 9th – 12th. The event is a major networking and sales event pertaining to the rental industry as a whole. Attendees can expect to be exposed to a vast array of cutting edge products and technology offered at the most competitive prices. Several of the participating companies offer hands-on educational tutorials geared towards exposing attendees to new products and services. Industry participants stand to gain a plethora of knowledge and expertise from seminars put on by industry leaders. Events include lunch and learns with rental industry pros from companies such as Copco Construction, Doosan Portable Power, Subaru, and many others. At the event Patriot will be exposing the solar trailer units that we manufacture and distribute out of Albion, MI. Each of these off-grid solar products can be utilized in construction, disaster relief, remote camping, remote monitoring, and many other off-grid applications requiring power or light. The Solar Light Trailer has gained major momentum throughout the U.S. as well as gained international attention. Similarly, the Solar Charging Trailer has also gained exposure because of the major benefits that this unit offers. These off-grid solar units have been regarded as a must have for the rental industry as a whole and can be expected to draw enormous attention at the 2014 Rental Show.